Homegrown conglomerate Godrej Group revealed its plans to focus on consumer products to spearhead its growth in the future. Expressing his views on the occasion of celebrating 119 years of the company's existence,Godrej Group chairman Adi Godrej told media:"FMCG and consumer durables is a major area of focus for us where we will grow both organically and inorganically.Currently, about 600 million Indians use one or the other products of Godrej. 'We have additional few hundred million consumers using our products outside the country. This gives us the largest consumer base of groups headquartered in developing world,' Godrej said, adding that the only other company which has more consumers is China Mobile. Besides, three years ago, Godrej Group had set a target to grow ten times in ten years, amounting to a CAGR (compounded annual growth rate) of 26 per cent annually. Of this, 15-20 per cent growth is organic and the rest will be inorganic, Godrej said. "Organic growth is mainly through FMCG where we are now in several countries internationally, including in Africa and Latin America," he said. However, he added that the company does not expect organic growth in all businesses at the same rate. Little over half of Godrej Consumer Products' turnover comes from outside India, the company's chairman said. On acquisitions, Godrej said, "Inorganic growth should be strategically important and value creating. We won't acquire businesses for the sake of acquiring." The Group also plans to grow its B2B business domestically, especially in defence production with the government encouraging the sector. 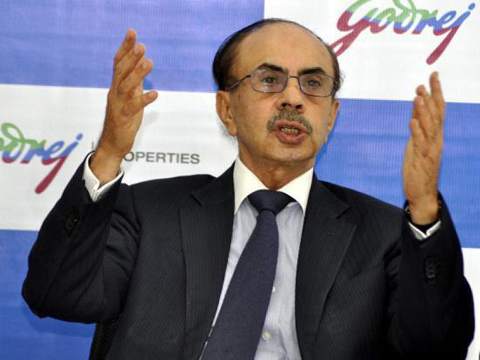 Godrej said he hopes that the government implements GST on time. "This will increase the GDP of the country to double digit figures, and will boost manufacturing tremendously," he added. Godrej pointed out that with e-commerce taking off rapidly, the Group will definitely use various channels to promote its products but does not want to foray into the segment immediately. "While we have acquired an e-retailing firm and merged it with our gourmet foods business, Nature's Basket, we are not considering getting into the e-commerce business directly," he added. As per a news piece in ET Retail.